Two genera of mites are known to infect species of Allium. The dry bulb mite (Aceria tulipae) is an eriophyid mite that survives on cultivated Allium species. It is often confused with the wheat curl mite (A. tosichella), though it is believed that the host range of the latter species may also include Alliums. Bulb mite species in the genus Rhizoglyphus can also be troublesome on Alliums. Infected seed may fail to germinate. Plants grown from infected seed may lack vigor and produce stunted, deformed leaves. 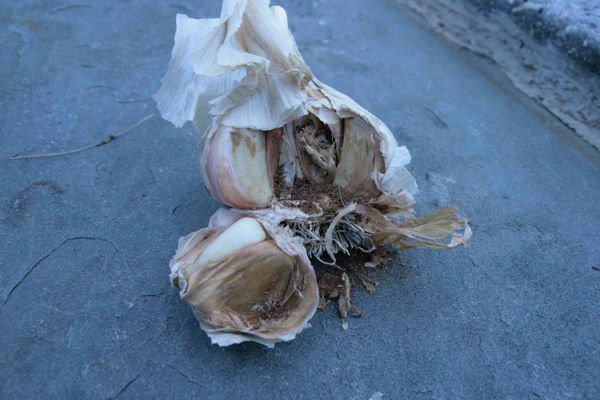 Plants may outgrow the damage if the infestation is not heavy, but mites may increase in number over the growing season and will remain in the harvested garlic. Viral symptoms may be seen. In the field, mites feed mainly on the roots and basal plate. In storage, the mites move into the garlic bulb, where their feeding activity causes sunken tan to brown spots to form on cloves. Desiccation may occur. Soft rot bacteria or fungi may also be present. Adult Rhizoglyphus mites are 0.5-1.0 mm long, have four pairs of legs, and are bulb shaped. Their legs are brown. 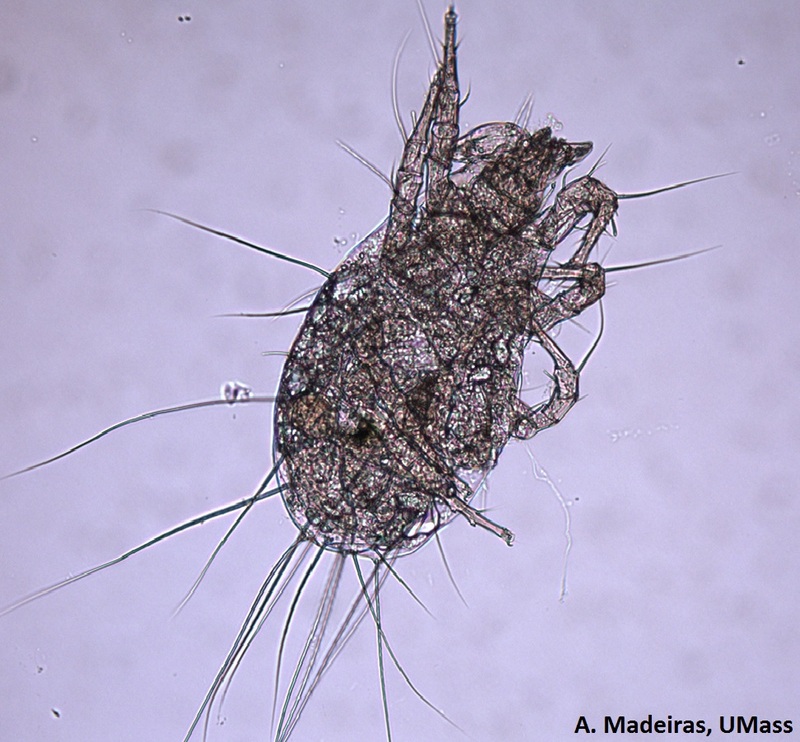 Eriophyid mites like the dry bulb mite are usually less than 0.3 mm long, have two pairs of legs near the front of their bodies, and are somewhat more conical or cigar-shaped. The bodies of both species are off-white to pale yellow in color and may be visible with a hand lens. These mites can overwinter in soil and also survive in stored garlic. Infected seed is the most common way dry bulb mites are introduced into a field. They can damage garlic in the field, but are particularly troublesome in storage. Their feeding can cause desiccation and creates wounds that provide an ingress for soft rot bacteria and pathogenic fungi such as Fusarium and Penicillium. In addition, dry bulb mites can transmit garlic allexiviruses. Plant clean seed. Hot water treatment of seed garlic is effective, but can decrease germination. Put seed in water heated to 130°F 10-20 minutes, or 140°F for 10-15 minutes. Soak seed for 24 hours in 2% soap (not detergent) and 2% mineral oil prior to planting. Mild mite infestations are often mitigated by the process of drying bulbs before storage. Rotate out of Alliums for at least four years. Control wild Allium species in the vicinity. Mites can survive on the residues of a number of crops. Plant only in fields where crop residue is thoroughly decomposed. Avoid planting Alliums directly after Brassicas, corn, grain, or grass cover crops. There is some evidence that predatory mites of the genus Stratiolaelaps (formerly Hypoaspis) may be effective for control of Rhizoglyphus species. Angela Madeiras. Garlic photo by E. Sideman.